The implementation of economic theories has profound effects on social and political decision making and movements. What is the value of money beyond its monetary worth? Why do some societies choose one economic system over another for the economic well-being of their society? How are our common everyday decisions closely interconnected with how society, the environment and the economy functions? How do we determine what is valuable to us as individuals and a society? In all of the above activities, journal entries, letters to the Editor, self-assessment evaluations, or emails to a friend are included at the lesson’s end as part of a reflection exercise. As part of their own reflective practices, teachers will pay close attention to student reactions and comments to judge engagement and use these anecdotal observations to alter, personalize, and strengthen lessons to be used the next year. Money holds the same value for everyone. Money is distributed equally given similar circumstances in the adult world. People always choose what’s best for themselves (or best for others). This unit is designed to introduce secondary students to the fundamental principles underpinning the study of Economics. In senior grades, in particular, students frequently find themselves weighing imminent economic choices that will affect their lives well into the future. The following unit offers learning events that require students to take active roles in a functioning classroom economy that is highly interconnected. Lessons are designed to help students understand that apparently isolated personal economic choices always have wider financial and social implications. 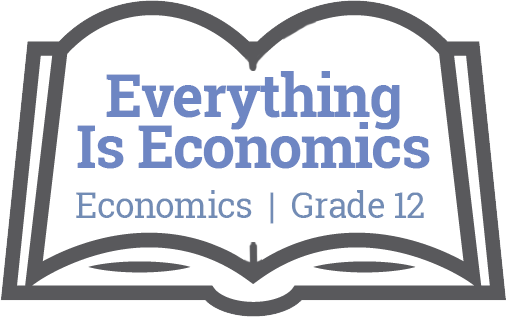 Instructional approaches in this unit involve authentic simulation activities, case studies, and debates on current economic issues. This unit is also structured to dispel student misunderstandings about the nature of money and how and why goods are produced, distributed, and consumed in a society. The unit’s activities are progressive in nature and allow for many entry points. Learning events in this unit can be easily differentiated for a variety of learners and grades. Economic systems have underlying and often opposing ethical standards and implications.